Proximel® Non-Border is a silicone foam dressing that features a unique tapered edge that allows the dressing to lay smooth around wound edges while helping prevent exudate leakage. 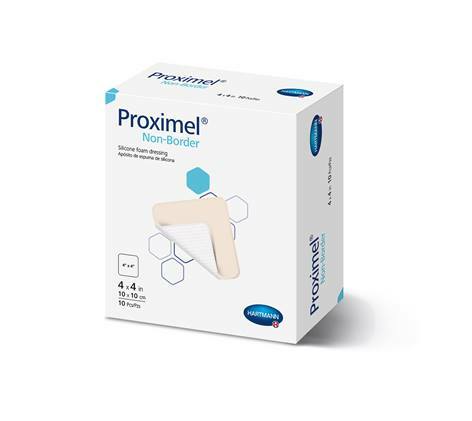 Proximel® Non-Border is indicated for pressure ulcers, leg and foot ulcers, traumatic wounds, surgical wounds, donor sites, skin tears, first- and second-degree burns and dry or necrotic wounds in combination with gels. 4"x4", 4"x5", 4"x8", 6"x6", 8"x8". Heel: 5"x8". HARTMANN USA shares the 200-year legacy of the HARTMANN GROUP, an international health care solutions company that has made substantial medical advancements in wound care and skin health.